Trouble Getting Approved in Florida? Snippet 1.) Quote: "§687.02(1) contracts for the payment of interest upon any loan, advance of money, line of credit, or forbearance to enforce the collection of any debt, or upon any obligation whatever, at a higher rate of interest than the equivalent of 18 percent per annum simple interest are hereby declared usurious"
Snippet 2.) Quote: "§516.031 (1) A licensee may lend any sum of money up to $25,000. A licensee may not take a security interest secured by land on any loan less than $1,000. The licensee may charge, contract for, and receive thereon interest charges as provided and authorized by this section. The maximum interest rate shall be 30 percent per annum, computed on the first $3,000 of the principal amount; 24 percent per annum on that part of the principal amount exceeding $3,000 and up to $4,000; and 18 percent per annum on that part of the principal amount exceeding $4,000 and up to $25,000"
Ron had a really tough year. First the last hurricane that passed through the area wiped out his house and flooded his out buildings, wrecked his car and destroyed all of his personal belongings. Then he lost his job because the company he worked for had to go out of business. All of their buildings and products along with equipment were ruined and they just could not recover from all of the damage and the losses. Fortunately, he was able to find another job working as part of the recovery and repair teams in the area. Although there has been lots of damage and families losing everything, there is lots of work for those people who are able and want to work. Ron has acquired an entire new set of skills in home repair and renovation work which will help him continue working in the many years to come. Ron also needs to also work on his financial situation. He lost everything, and although he had some insurance coverage, there is still a great deal of expense that he has to cover. He was out of work for a few weeks, missed some payments and his credit rating nose dived. He needs to find a loan to help complete rebuilding of his home. The insurance money is almost all gone and he needs another $10,000 to finish off the house to a point where he can live in it again. Ron is working more than ten hours a day. There is just so much work out there and he can work as many hours as he wants. He also knows that he needs the money as well and is trying to make as much as he can to recover from the losses caused by the hurricane. With this loan, Ron, can finish dry walling the inside of the house and complete all of the flooring. Once this work is completed, he can move in and will need to purchase furniture. There has been lots of help from neighbors and local companies as well. Although Ron could actually use a larger loan, he wants to keep it as small as he can to avoid going too far into debt. He is also paying for a car loan and a mortgage on the property, even though the home was destroyed. Ron is one of the lucky ones. Although he needs to borrow money to complete his house, he did have insurance coverage for the car and his home. With this money he was able to recover fairly well. He also found and learned new skills that will help him a great deal in the future. Although he is still recovering from all of the damage to his home and finances, the future is looking bright for Ron. 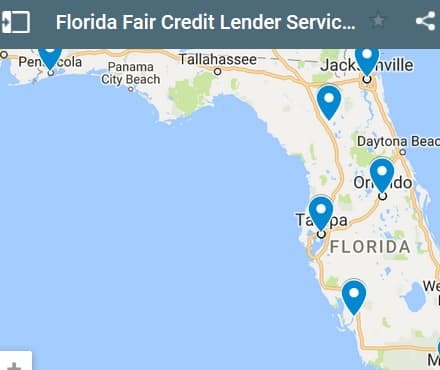 If you live in the State of Florida and you're struggling with a bad credit rating we hope our website helps you in some way. Last 5 debt service loans approved in the State of Florida. Source: WFL Lender Pool. Updated Weekly. Principals rounded to the nearest $1000. Relative interest rates listed below in order left to right. Note to debt service providers: contact us for listing removal. You can see in the list above that most of the providers help with counseling and debt relief services. On our Florida city pages you will find more providers who specifically provide debt consolidation loans. Keep in mind that many companies who advertise debt consolidation are not really doing so - they're providing debt relief which is completely different. With debt relief you are negotiating with creditors in an effort to reduce the principal you are actually paying back. With a true debt consolidation you are borrowing enough money to pay off all your creditors in one shot. $10000 dollars is a relatively small debt consolidation loan. Some banks and/or credit unions won't even approve loan for less a specified amount higher than that. The reason is profit. Lending institutions know they can't really make a lot of profit from small loans, and certainly not short term loans. They would rather grant loans for at least 3 years and for larger amounts of money. This way they get "more bang for the buck". They don't want to use up valuable staff time on an entire loan process when they're only making a few hundred dollar in interest. Therefore, a popular consolidation loan request for $5000 - $10000 is often hard to come by. This is where our lender pool comes in handy. In our network we have private lenders who will approve consolidation loans for these lower principal amounts. Their interest rate charges all vary, so you should look closely at their loan agreements and contracts before entering into another debtor situation. You don't want to get stung with any "fine print" down the road (e.g. - balloon payments). We've never heard of a lender in our pool using sneaky tactics like this, but you should always double check any loan agreement you're considering. In this user example Donna wanted a consolidation loan for $10000 to pay off her Visa card, Mastercard, and some other short term loans she hadn't been able to pay back. She owed Visa approximately $4000, Mastercard $2500, and a few relatives close to $3500. We rounded all her debts to the nearest $500 for the purposes of her example. Donna's financial situation really wasn't all that bad, and her credit score wasn't damaged to the extent she was going to be paying a really high interest rate. She just wanted to clean things up and get a new start. She only had one blemish on her credit rating at the time of this application. She had bought a dress from a department store for a wedding. She didn't have enough room on her credit cards to buy the dress, so she chose to use the department store card. The problem with this scenario is people often forget about this extra credit card. Even worse is when they move to a new location and don't get their mail forwarded. This is the perfect storm for a person's credit rating. They're not receiving the balance statements and the final notice statements. When they should have been dealing with the matter, they're oblivious to the damage that's being done to their credit. In Donna's case she just happened to remember the debt she had with the department store in Orlando. She called them up and paid them off as soon as she remembered, but she was 3 months in default. She used our service to find a private lender in Orlando. She borrowed $10000 over a 2 year period. This was a 100% unsecured loan approval based on her steady employment at a nearby hospital. Below is the raw calculation that doesn't take into account possible extra fees from the lender. 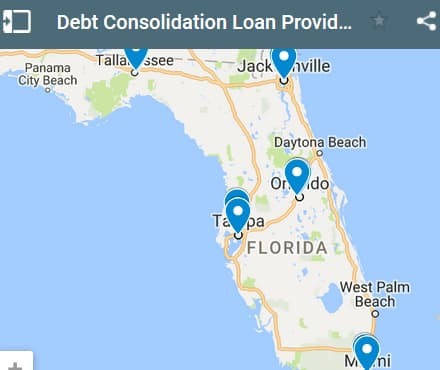 If you live in the State of Florida and you're trying to get approved for a debt consolidation loan, we hope our website helps you find a good lender and a low interest rate.